Volatile Oils composed of azulene, borneol, terpineol, camphor, cineole, isoartemesia ketone and a trace of thujone. Also contains lactones, flavonoids, tannins, coumarins, saponins, sterols, a bitter glyco-alkaloid (achilleine), cyanidin, amino acids, acids including salicylic acid, sugars including glucose, sucrose and mannitol. Yarrow Oil should not be used during pregnancy. Should not be used by people taking anti-coagulant drugs. Large doses can cause overdose and symptoms include headache, vertigo and dizziness. 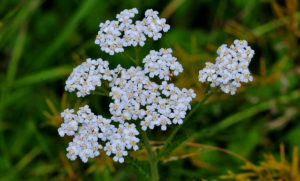 Yarrow may cause anaphylatic shock in people who are hypersensitive to ragweeds.